Foolishly optimistic, somewhat deluded person that I am, I always take some time at the end of December to reflect on the past year and set some goals for the next one. The idea is to come up with a list of resolutions that will help transform me into a kinder, nicer, more organized, healthier, richer person with a better figure, a well-behaved and all around perfect family, and a much cleaner house. While I haven’t accomplished all that I would have liked to in 2010–and honestly Mr. President, who has?–a look back at the history of my New Year’s resolutions tells me that at least I’m continuing to make a tiny bit of progress every year. 1988: I will get back to the weight on my Driver’s License. 1997: I will get back to my weight when I got married. 2007: I will follow my new diet religiously until I get back to my pre-pregnancy weight. 1992: I will not spend my money frivolously and save enough money to put a down payment on a small house in Santa Barbara. 1998: I will not spend any money at all on anything, under any circumstances, and save enough to put a down payment on a small house in Isla Vista, with the help of my parents and anyone else who might want to invest. 2006: I will stop buying so many new pairs of shoes. 2009: I will stop crumpling my tax-deductible receipts into teeny tiny balls of paper that raise my husband’s blood pressure every April. 2011: Money schmoney! It’s all about quality of life. 2007: I will stop smoking. 2008: I will stop smoking. 2009: I will stop smoking. 1997: I will spend more time with my family. 2006: I will spend more quality time with my family. 2008: I will redefine quality time with my family to mean that we all have to be awake, with no one yelling, but not necessarily doing the same activity in the same room at the same time. 2011: I will spend more quality time with my family and my dear friends, but only when I’m not grumpy. 1998: I will treat my body as a temple and eat only healthy, organic foods. 2000: I will only order out for pizza once a week. 2003: I will stop counting Mai Tais as a serving of fruit, even though they come with an orange slice and a maraschino cherry. 2006: I will sit down with my family and eat a healthy, balanced meal at least once a week. 2010: I will eat a piece of dark chocolate and I will drink a glass of red wine every night, but only for the good of my health. 1982: I will write a novel before I’m 30. 1995: I will write a novel before I’m 40. 2011: I will write a novel before I’m 50 or start lying about my age immediately. 1993: I will not fight with my boyfriend about household chores. 1994: I will not fight with my husband about household chores. 1999: My husband will stop pretending he knows how to fix the car and I will stop pretending I am competent in the kitchen. 2007: My husband will stop pretending he doesn’t see the pile of laundry that needs to be folded and I will stop pretending I don’t know how to pump my own gas. 2011: My husband will make sure I have gas in my car if I give him enough warning when the tank is low and I will stop making New Year’s resolutions on behalf of other people. 2005: I will not fight with Koss about doing his chores. 2006: I will not fight with Koss about his homework, doing his chores and cleaning up his dirty sweat socks. 2007: I will not fight with Koss about his homework, doing his chores and cleaning up his dirty sweat socks and his sweaty t-shirts. 2009: I will not fight with Koss about his homework, doing his chores, cleaning up his dirty sweat socks and his sweaty t-shirts, and how much time he spends on the computer. 2011: Koss will be responsible for his own homework, his own chores and his own dirty clothes. But I am still his mother and I can make resolutions for him if I want to! 2011: I will put away a dollar in a little jar every day and maybe when I retire I’ll be able to afford an R.V. that I can park somewhere in Santa Barbara. Oh, who am I kidding? Pass the champagne (or better yet, the wine and chocolate!) cheers to a wonderful New Year for us all. Share your resolutions with Leslie by emailing Leslie@LeslieDinaberg.com. For more columns visit www.LeslieDinaberg.com. Originally published in the Santa Barbara Daily Sound on December 31, 2010. As much as I love getting mail during the holiday season–what’s not to like about the season where chocolate catalogs finally outweigh that depressing stack of bills and you get daily reminders that good old so-and-so you shared a cubicle with in 1991 is still alive and kicking?–I have to admit that sometimes I get a little tired of reading about other people’s perfect kids and their numerous dazzling vacations from their already oh-so glamorous lives. Obviously not everyone has genius children, ran a marathon, expanded their 4,000 square foot home another 2,000 square feet, or finally finished that screenplay this year. So what if you’re not in the mood to gush with sincere emotions about how much you love your family and how meaningful your work life is this year, let alone use the word “blessings” multiple times in your annual holiday missive? What kind of letter can you write if your year basically sucked and your main request to Santa is that 2011 will be a little bit better? Dear Friends and Family. Yes, I am writing this on the back of an old shopping list/receipt/kids’ report card. I hope you don’t mind the coffee and grease stains. Sometimes I think caffeine, sugar and alcohol are the only things that make life worth living once you’ve been evicted from your apartment and your car has been repossessed. If you can’t send cash, please send wine. Donuts are good too, so are Cheetos, really anything from the sweet and salty snack aisle will do in a pinch. We’ll also take prepaid phone cards and gift cards in any denomination. Seasons Greetings. 2010 was not the greatest year for our family. I was let go by the bank in March and though the larceny charges were eventually dropped, the legal fees sent us into bankruptcy. During the course of the pre-trial motions my computer was seized and they found a few questionable websites in my browser history. My wife just doesn’t understand me anymore and got so depressed that she took off on a six-month retreat with her yoga instructor so she could “get centered.” I guess her chakras were finally in order because by October she was back in the country and we were back together. In November we sold our house (finally, for about 75% less than we paid for it) and all of our remaining family heirlooms, then purchased a used Winnebago, which we are now driving around the country. We’ll be coming your way soon. Hope the fridge is full, the water is hot and the towels are clean. Compared to These People, My Year Was Actually Pretty Good. 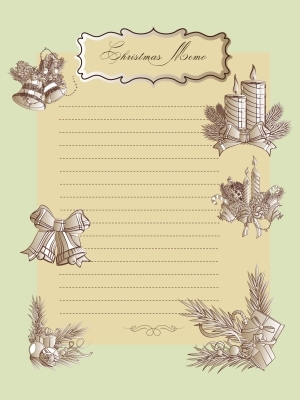 Share your favorite holiday letters with email. For more columns visit www.LeslieDinaberg.com. Originally appeared in the Santa Barbara Daily Sound on December 17, 2010. She was talking about diaper rash and Desitin, but over time I’ve found that her advice applies almost everywhere from the schoolyard and the soccer field to the domestic front and delegating at work. You can explain it by whatever nature versus nurture notion noogles your noggin, but the fact is that men are overwhelmingly better than women are at letting go of perfectionism. They don’t really notice–or if they do, they certainly don’t care about–that pile of laundry waiting to be folded on the couch. It’s simply an obstacle to sit upon or pushed aside in their quest to find a place to rest their fatigued fannies after a hard day’s work. They aren’t the least bit disturbed if the dinner table lacks floral finery, or even utensils, as long as there’s an ice-cold beer at their fingertips. They may be masters of their domains, but most of them have absolutely no interest in anything resembling a throw pillow, quilt or home decor accessory (unless it comes in HD and surround sound). And as for calendars, schedules and to-do lists? Forget about it. Somehow it’s more manly to store things “in your head,” despite the sometimes sieve-like filter associated with this system. Let’s face it, there are a lot of things that men simply don’t care about and thus they don’t stress about. As hard as it is for me to admit it, I think they may be on to something, especially when it comes to the holidays. Have you ever in your life met a man who felt guilty when a caring neighbor brought over a homemade dish of goodies and he didn’t have a lavish platter at the ready to gift them in return? You don’t see men stressing about losing weight to fit into a cute new outfit for the company’s holiday party or going to 17 different stores to find the perfect Secret Santa Gift for the receptionist in their office who won’t even know it’s from them. Nope, men don’t take it as their seasonal call of duty to personally manufacture every bit of holiday magic that comes into their household. For the most part, whether the laundry is waiting to be folded or not, they sit on the couch, relax and enjoy the spirit–and spirits–of the season. Which is why this year I’m going to try to take the holidays like a man by relaxing the perfectionism, kicking back and enjoying them. When Leslie’s not obsessing about not obsessing about her holiday to-do list, she can reached at Leslie@LeslieDinaberg.com. For more columns visit www.LeslieDinaberg.com. Originally appeared in the Santa Barbara Daily Sound on December 10, 2010. When it comes to traditional religion, I’ll readily admit that I’m more Jew-ish than Jewish. You won’t find me in temple unless there’s a Bar mitzvah or a book signing, and I’m certainly not one to pass up an offering of bacon-wrapped shrimp. They’re delish! But there’s one part of Jewish cultural tradition–besides the latkes–that I have embraced with gusto: the language. No, I’m not talking Hebrew, which is way too complicated and confusing for the short attention span theater of my brain these days. I get a case of Hanukkah guilt before the gelt every year when need a refresher course on the dreidel symbols. 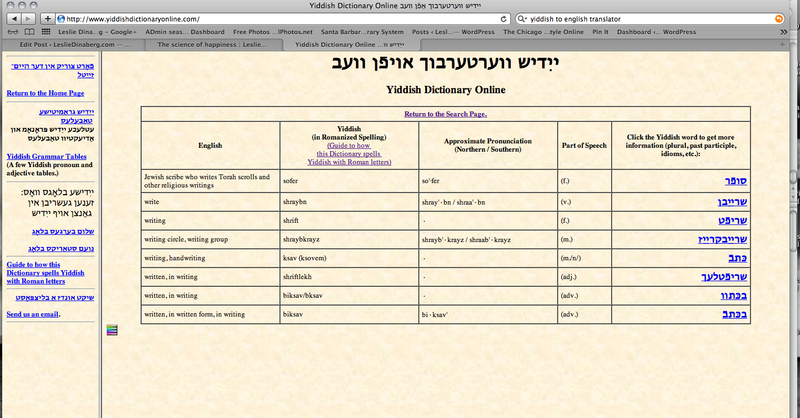 No, I’m talking Yiddish. And whether you realize it or not, so are you. You may not even schmear your bagel. (Which originally referred to a spread of cream cheese on a bagel but has extended to anything that can be spread, and in some cases refers to “an entire set or group of related things”, or the expression “the whole schmear.”) But from schmear to eternity, I’d bet my last bit of gelt (a Yiddish word for money, and for the chocolate coins eaten on Hanukkah by some and year-round by those of us that frequent See’s Candy) that words like glitch? (literally “slip,” “skate,” or “nosedive,” which many people now use to mean “a minor problem or error”) or zaftig (plump, but pleasantly so) have crossed your lips from time to time. You’re speaking Yiddish and you don’t even know it. Not to belabor my spiel? 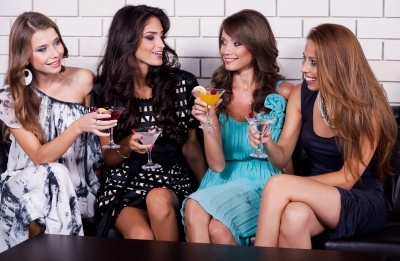 (a long, involved sales pitch), or act like a maven ? (which comes from the Hebrew “mevin,” or “one who understands,” but has evolved to mean a know-it-all, and is often used sarcastically) of Yiddish vocabulary, but I’d bet you also use the words klutz? (which literally means “a block of wood,” but is often used for a dense, clumsy or awkward person) and nebbish (an insignificant, pitiful person; a nonentity) without giving them a second thought. You’re a Yinglish speaker too. I really don’t mean to be a noodge (to pester, nag, whine or be a pest or a whiner) about this, but chances are good that even somewhat vulgar Yiddish words like dreck (which means worthless material, especially merchandise) and tush (buttocks, bottom, rear end) have crossed your lips from time to time. So here’s my Hanukkah gift to you: the next time someone asks you if you speak a second language you can tell them you are fluent in Yinglish and you do know more than bupkis (zero, or nothing) about Yiddish. 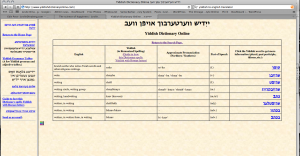 Share your Yiddish or Yinglish vocabulary words with Leslie@LeslieDinaberg.com. For more columns visit www.LeslieDinaberg.com. Originally published in the Santa Barbara Daily Sound on December 3, 2010.